I am blessed to be the mother of two beautiful and loving children ages 7 and 3. I am the wife of my best friend and husband, he's pretty cool! I am also on this journey of health and wellness myself. I never thought too much of nutrition and what was in my food until the last two or so months of my first pregnancy with my son. I gained weight very fast in that last trimester and up until then I would eat and eat and never feel full! I decided I was going to eat until I was satisfied instead of full. I then began thinking about what I was eating. When my son was born I search what I could find about feeding him and I decided to breast feed for as long as I could. When he began eating food I tried to give him organic baby food and cereals. But I didn't know much. I didn't have much knowledge, just a desire to feed my son as healthy as I could. Fast forward to 4 years later when I had my second, my sweet little girl! After a couple of months at home I began working in my esthetics practice again and began looking at pursuing my interest in nutrition and wellness. 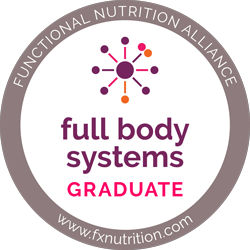 I decided to attend Institute for Integrative Nutrition in 2013 and there I began learning about the world of health and wellness. I am a professional student! At least that is what my family tells me! Although I would rather not have to go to school and just learn by osmosis I understand that to help those I love and those around me, I need to continue in pursue this path. You can read more about my professional certifications below. Everyday I am learning how to feed and take better care of myself and my family. It can be challenging with busy schedules but it is so rewarding to know that I am giving myself and my family the gift of health. That is what I want to share with you also! I am so happy you are here, its a step in a positive direction! If you feel that desire in your gut that you should be pursuing health and wellness in your life and family, do not ignore it! You will be glad that you listened! I enjoy making jewelry, being creative in general! I like the idea of getting really good at Pilates....on my bucket list! LOL! I love all kinds of tea! One day I am going to travel and collect teas from all over! I like quiet time! Instrumental music, bubble bath and candles!!! I enjoy taking naps...doesn't happen very often these days but when I get one in, it is right on time! I like watching a good movie! Amazon Prime has been my friend. I love seeing my children smile and play together (it's a nice alternative to the fussing they can do at times). I love cooking and making my own smoothies!